All you need is a sheet of paper and a printer, a length of ribbon or string, scissors and glue. 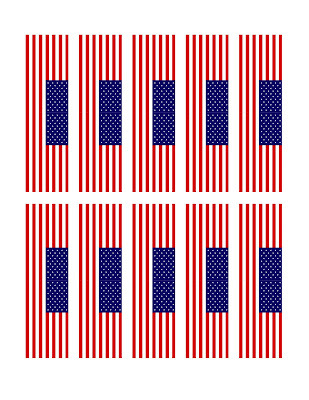 - Print the flags above by clicking on them. A new page with nice big flags will open up (it may take a minute...they're high quality so they won't print fuzzy). You can print them straight from that page. - Using your scissors, cut out the flags. - Decide where you'd like to hang your garland and measure and cut ribbon or string to your desired length. - Fold your flags in half, coat one half with glue, then place ribbon or string in the crease and press two flag halves together. - Continue until you've got enough flags for your garland. You can measure the distance between flags for consistent placement or let them stagger. This project is so simple and makes a nice patriotic impact!